Heat up your style game with this inherently happy color. The fashion pros have spoken—the color pink will be one of the major trends of 2017. 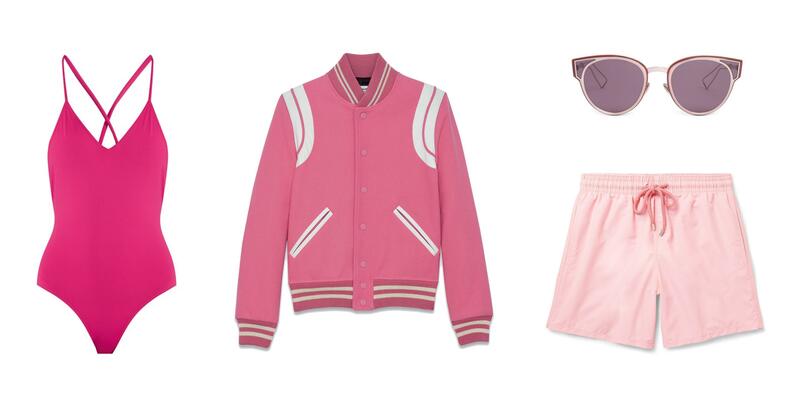 Luckily, there are countless ways to get on board with cotton candy hues and deep gem tones. Guys, that goes for you too. From gym clothes to swimwear (if yourwinter getawayis more beachfront than slopeside), we’ve rounded up 8 pink pieces to invest in now. Perfect for walking around the locker room or the pool deck, these calf-leather sandals are extra comfortable thanks to a molded footbed. Bomber jackets were all the rage last fall—and it looks like the momentum will keep going with updated spring colors. This varsity style take from Saint Laurent has subtle luxe details like leather trim around the shoulders. Quick drying fabric on the outside is lined with a mesh insert for comfort. Stash your credit card in the pocket protected with a velcro closure. This one-piece can pull double-duty as a bodysuit when it’s paired with jeans. Worn either way, the back of the suit may be the best part—it scoops low and features a criss-cross lacing pattern. Different shades of pink come together in a cat-eye silhouette. These contemporary glasses are made of metal and feature the Dior logo on the arms. As versatile as it is fun, this leather purse can be worn on the shoulder, as a cross body, or even as a clutch. Two pockets inside make organization simple and a zipper under the flap will keep everything secure. Created for men, but totally appropriate for women, this top is perfect weekend wear. The soft jersey cotton-blend fabric ensures coziness without sacrificing style. Take your practice to the next level in these bottoms. Super stretchy fabric allows you to move through any pose with ease while the sweat-wicking properties ensure you stay dry. Bonus: Pick up the matching sports bra for a head-to-toe gym look.